As she approached her 70th birthday, Charlotte Rampling earned her first-ever Oscar nomination for 2015’s 45 Years. She lost to Brie Larson’s turn in Room, but at least she received some love from the Academy! As their 45th anniversary nears, Geoff Mercer (Tom Courtenay) and wife Kate (Rampling) plan to celebrate with a massive party. They entertained a similar concept for their 40th, but Geoff required emergency surgery and that scuttled the bash. To compensate for that, the retired couple intend to host dozens of friends. However, when Geoff gets a letter than reveals the fate of his former lover Katya, the situation changes, as he and Kate confront the way this information impacts their relationship. The nature of Katya’s demise adds intrigue to the proceedings. She disappeared half a century earlier but no one discovered the body until modern day. That means Geoff was left with uncertainty and “what might have been” for all that time, factors that give Years an interesting twist. One that it needs, as the film easily could turn turgid and tedious. Given its almost total concentration on interactions between Kate and Geoff – and its refusal to entertain soap opera dramatics – the film threatens to become so introspective that it goes nowhere. I do appreciate the movie’s lack of theatrics, though, especially because the storytelling allows the audience to make their own deductions. For instance, the rush of youthful memories related to Katya give Geoff renewed sexual vigor, much to Kate’s delight – it seems clear they’ve not been intimate in quite some time. All goes well in the sack until Kate asks Geoff to open his eyes. When he looks at his wife, he immediately loses his erection. Why? Because he can’t fantasize about Katya any longer. That’s how I interpret the events, at least – the film doesn’t spell out this element to us, and that’s why it works. Much of the movie provides subtextual elements the viewer figures out without direct guidance, and that means it offers a more involving journey than one that follows a more explicit path. Both actors do well in their roles, but Rampling probably fares better. Again, some of that is because the movie concentrates on her, so she earns more screen time. The film expands Kate’s character more than Geoff’s, so Rampling receives a more three-dimensional depiction. Kate also seems like a better fleshed-out role in general. While not a true weakness, the semi-superficial manner in which the movie treats Geoff seems like a minor liability. He comes across as a semi-grumpy jerk too much of the time, and the film doesn’t allow him to expand much beyond that. I’m glad Courtenay doesn’t soften his edges, but a little more depth would’ve been nice. Because we spend so much time with Kate, though, this becomes less of an issue, and the rich manner in which the movie treats her more than compensates. 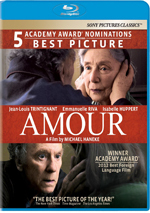 In a part that lacks broad theatrics, Rampling aptly portrays a woman whose marriage threatens to rupture out of nowhere. As much as I appreciate the movie’s quiet nature, I will admit the American in me wishes it could be a little “louder” at times, as its heavily introspective nature can make it drag – one man can only stand so many shots of a mopey-looking elderly woman. Despite those slow spots, though, 45 Years offers a largely engaging human drama. 45 Years appears in an aspect ratio of approximately 1.85:1 on this Blu-Ray Disc. This became a pleasing presentation. Sharpness was strong. Virtually all of the film looked concise, with nary any softness on display. No concerns with jagged edges or shimmering occurred, and edge enhancement remained absemt. Source flaws also failed to create problems. In terms of colors, Years went with a palette that favored a cool teal tone and some amber. Within those parameters, the colors appeared pretty clear and concise. Blacks were deep and firm, while shadows showed good delineation. All of this left us with an “A-” transfer. One shouldn’t expect much from the film’s DTS-HD MA 5.1 soundscape, as it remained decidedly low-key. Still, it offered a bit more pep than expected. The film included no score, but effects used the side and rear speakers in a moderate manner. Not much occurred in this regard, as this was a chatty movie, but the mix managed to spread elements in discrete locations, and these moved well. For instance, an airplane quietly flew from left front to left rear to right rear. Nothing here dazzled, but the effects prompted more involvement than I anticipated. Audio quality was fine. Speech sounded natural and distinctive, without edginess or other issues. Effects were clean and accurate; they didn’t tax my system but they satisfied. This was a more than acceptable soundtrack for a quiet character piece. No extras appear on the disc – not even previews for other movies. 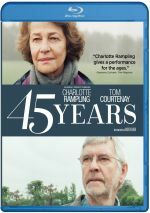 With an intense character focus, 45 Years delivers a quiet and powerful drama. It lacks phony theatrics and creates an involving effort. The Blu-ray delivers excellent visuals and perfectly acceptable audio but it lacks supplements. The absence of bonus features disappoints, but the movie itself satisfies.